One of my main preoccupations over the last couple of weeks while preparing for the end of year exhibition is how to divide up the space. Obviously for me this involves figuring out where the walls should go and what should go where to make the exhibition make as much sense as possible. But, you know, a bit of literal mindedness and it’s only a small leap from how to divide the studio to Gordon Matta-Clark and the chainsaw and sledgehammer approach to redefining architectural space. The 1970s may have a lot to answer for in all sorts of ways, but some pretty ground-breaking – or in Matta-Clark’s case building-breaking – art was made then and it’s work that still resonates and that continues to influence subsequent generations of artists. Matta-Clark’s work was based around the notion of An-Architecture: a deconstructivist approach to architecture in which existing buildings were physically cut apart. 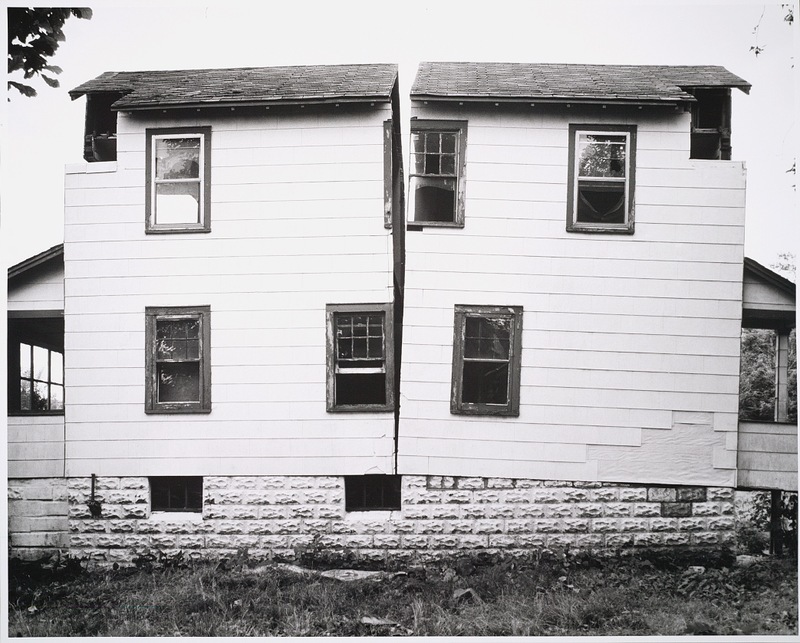 In Splitting, Matta-Clark divided a standard family house, filming the process. Matta-Clark’s work is shown in various forms: as film, as photographs and as structure, with sections of building brought into the gallery space. Though the extremity of the approach is apparent in the photographs, it’s on film that the work really comes to life. The process of cutting into a building is an interesting one. By definition destructive, it’s also a process of revelation as layers of history are uncovered. And of course, new perspectives are created as unexpected vistas open up. 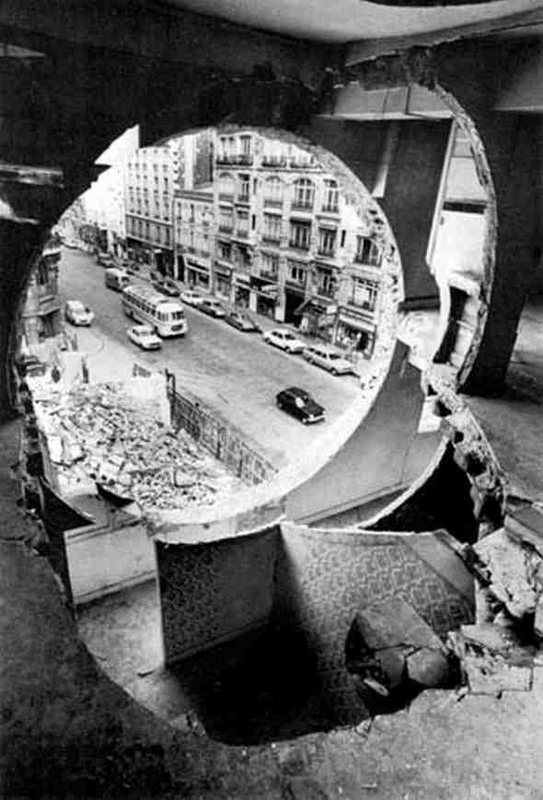 There is an anarchy to Matta-Clark’s work that I find compelling. It’s brute force as art-making but there’s something I really like about the absolute determination of the approach. Artists have form for adopting buildings in poor condition and turning them into studio spaces. If a few get broken apart along the way, well, perhaps that’s just the way these things go. 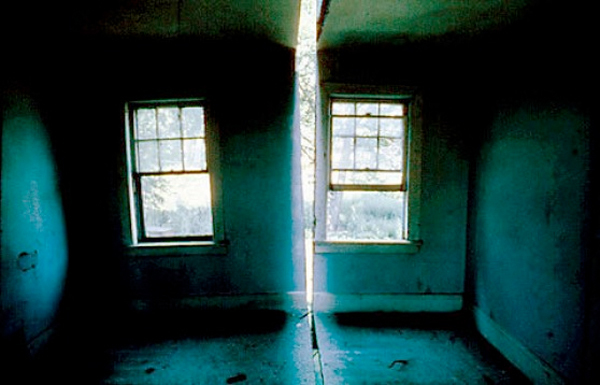 This entry was posted in Architecture, Film/Video, Intervention, Performance, Photography, Sculpture and tagged anarchitecture, architecture, art, buildings, Conical Intersect, Conical Intersect (Building Cuts), film, Gordon Matta-Clark, photography, sculpture, space, Splitting by Ann Jones. Bookmark the permalink. Great to see these films! p.s. I’d like to “challenge” (?) you to the 30th of September deadline re: the website stuff. Check in at end of each month? June,July, August… What say you? I say, eek! I’ll let another summer slip by if I’m not careful so your challenge sounds like just what I need, so yes, let’s do it! Fabulous. I know it’s so easy to let it slip by, especially the summer. I’ll DM you on twitter my email – not sure how to do it privately here.